It feels SO GOOD to have my kitchen back. We survived though. It wasn’t easy, but I think that, in the end, it was worth the inconvenience and mess. Before you continue reading, make sure to check out the Before photos and the Process photos to get the full picture of the transformation. We started the renovations at the end of the May and it’s now almost the end of June and everything is done! Meet my new kitchen! We hired The Home Depot to do everything from demo to painting to cabinets. They subcontracted out to Gorr Flooring who were fabulous to work with. We ended up getting all new appliances except the fridge. I was going to keep my dishwasher, but when they took it out, they told me that it was done. Thankfully, it was the only unexpected extra expense. I knew that things could come up in a renovation so I’m grateful that was it! Plus, now everything matches so it was a good thing. 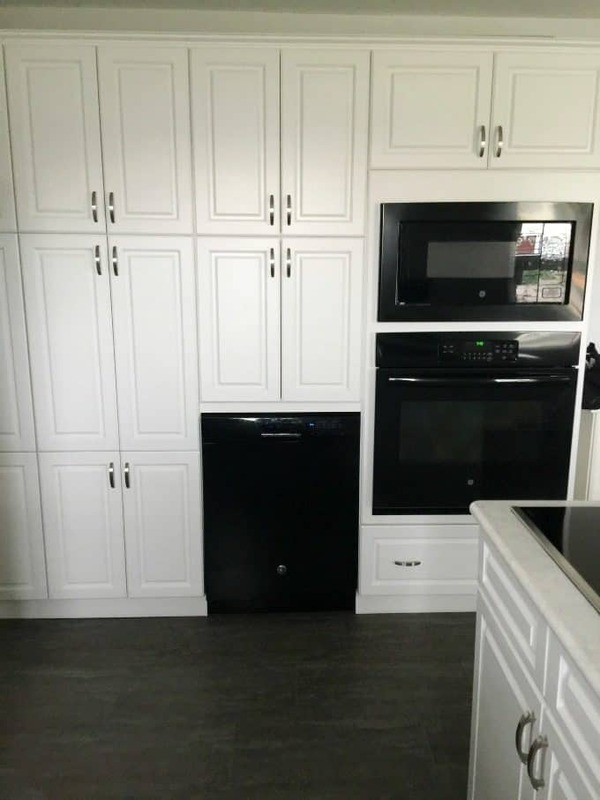 The cabinets are from Thomasville Cabinetry (bought at The Home Depot). I’ve always wanted a white kitchen. I think it will brighten the place up. I found it too dark and dull before. The appliances ended up being all GE. I asked a friend who used to sell appliances and she recommended that brand. I bought the extended warranty on all of them (except the microwave) just to be on the safe side. They say that appliances aren’t built like they used to be. I’m just glad to have a cooktop that finally works. My old cooktop would work off and on again which was very frustrating. 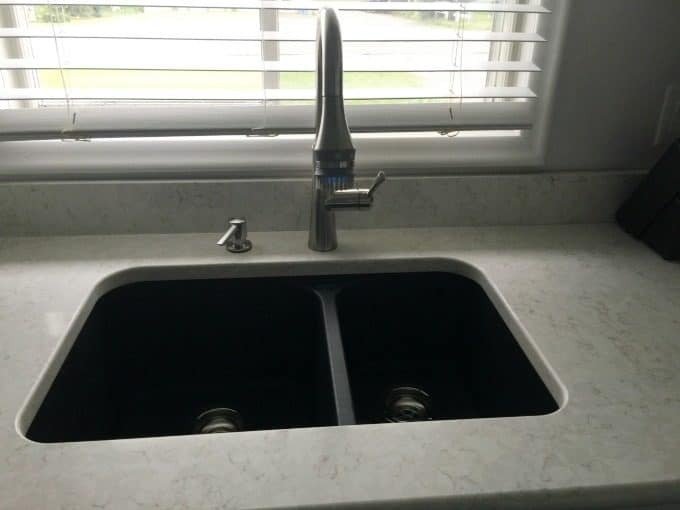 We got an undermount Blanco sink in black. I was thinking about getting a farm sink at first, but John vetoed the idea. He didn’t like that they stuck out of the cabinets. The faucet is American Standard’s Huntley Pull-Down faucet. I’ll be writing a post all about it soon so stay tuned. They also added to porcelain tile to my kitchen, dining room, two entrances and hall. I had hideous flooring before that the contractor botched installing. All I can say is good riddance! The countertop is quartz from Granit Design (through The Home Depot). It was pricey, but worth it. The only thing left that I still want to get are bar stools and a small kitchen table. Our old table doesn’t really match. I can’t wait to get back to making my recipes. I missed doing them! A person can only eat so much takeout. On the plus side, I feel much more confident using the BBQ! I grilled almost every day. Have you ever gone through a kitchen renovation? 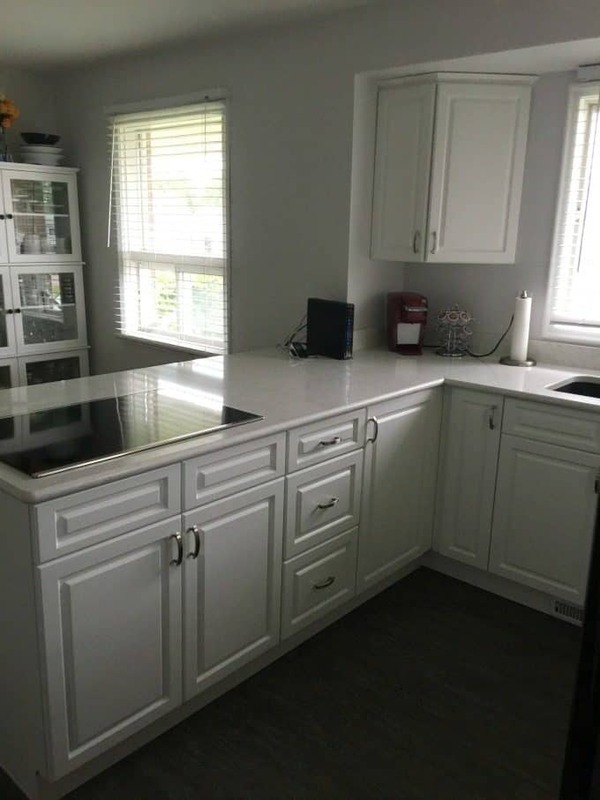 Your kitchen from before and after is truly amazing! If I had my kitchen remodeled I would do it like yours. Your new kitchen is gorgeous! I just love it!!! What a beautiful kitchen, it looks amazing. Great job on the kitchen it’s beautiful ! Well done! Love that countertop! We have been through a remodel. Our house in NH had a small kitchen boxed into the corner of a larger area. We changed the layout to open it up and installed new cabinetry, then used a small table for the eat-in part. It was so much nicer. Recently, I was “walking down memory lane” and I looked at recent photos of the house we lived in. It had been recently sold, so the listing and photos were available. The listing agent had called it a “cook’s kitchen,” so I wondered who had changed it. Nope! Just the same old kitchen we put in about 15 years ago. Hahaha! Absolutely lovely! What a wonderful transformation. Wow! That is one incredible transformation! I love it and I’m so jealous of all your cupboards! Even all my stuff would fit in there. (I have shelving units stuffed in my coat closet). Your kitchen looks so modern and functional. Such a lovely job. YOu’ve got a beautiful huge kitchen!! Your new kitchen looks great. So fresh and lots of storage. We did a gut renovation on our kitchen about 12 years ago. Everything was torn out. Walls, ceiling and floors. We found the original ktchen under the wall board the previous owner had slapped up when they “redid” the kitchen it was a terrible job. They even covered up the wall outlets. We also went with white and are now tired of it. I put in 5g’s worth of new wiring though. Each appliance and exhaust fan have their own circuit breaker. Each pair of outlets the same. You were right to get the insurance plan. My wife has a habit of blowing up the stove/oven every year while cleaning for Passover. Usually it is the oven igniter that is replaced but we’ve also had 3 control computers get blown or melted. The fridge is on its third 4yr contract also. I’m curious as to why you have an electric stove? I’ve tried them and prefer gas. I find there’s more control of the flame this way especially when I’m simmering a soup or making something that really needs total control during the cooking process. Enjoy the kitchen I hope you have many many years of “happy cooking” in it. Oh, my kitchen is 7’x9.5′ and in total cost $25,000.00 to renovate. Than you FIL for that birthday gift. Love it! Looks like you have a ton of storage space! I am sure you are enjoying it! Oh Stacie, it came out sooo nice, magazine worthy! I love all your choices. I wish I do a kitchen reno. Glad you could spiff up on BBQ’ing while your kitchen was out of commission! Beautiful! I loved seeing the ‘after’ pictures of your reno. Looks like a wonderful place to cook. I’ve never done that type of renovation before. Absolutely in love! I’d love to have a nice, clean and bright kitchen like this. 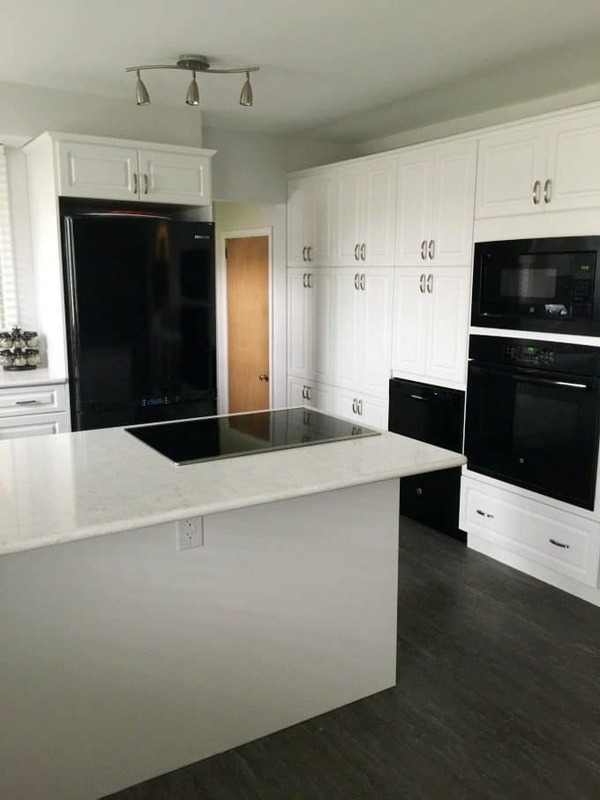 The quartz countertop is to die for! Looks great! I haven’t personally been through a kitchen remodel, but many of my friends have and it looks like a long and arduous task! The kitchen looks good, and I like the size of it. I love everything that was done to it. 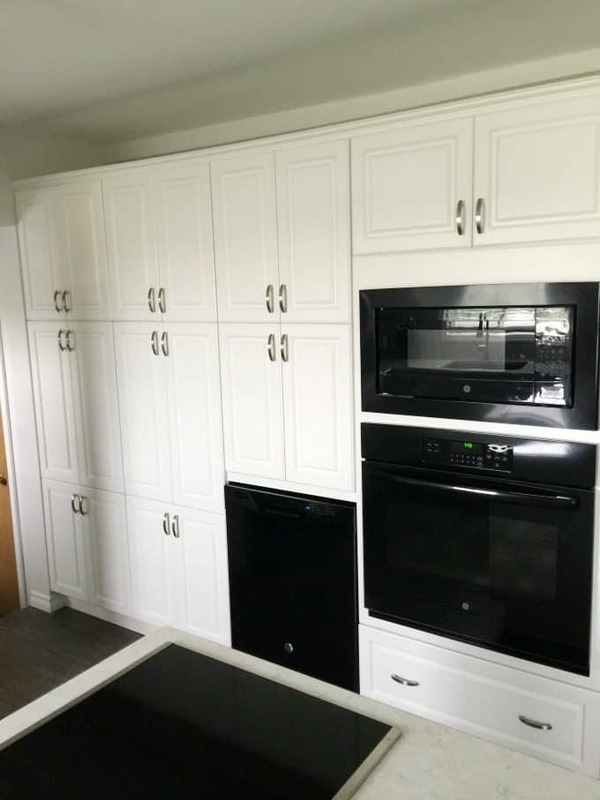 I love all the cabinet space you have on the one wall, looks great! And I love the quartz for your countertops, it’s what I would choose for a kitchen. No I haven’t, but yours is gorgeous! That is quite the transformation! I love quartz after seeing it while house hunting recently. I have never been through a kitchen remodel but we are about to move into a house that has a renovated kitchen and I am so excited. 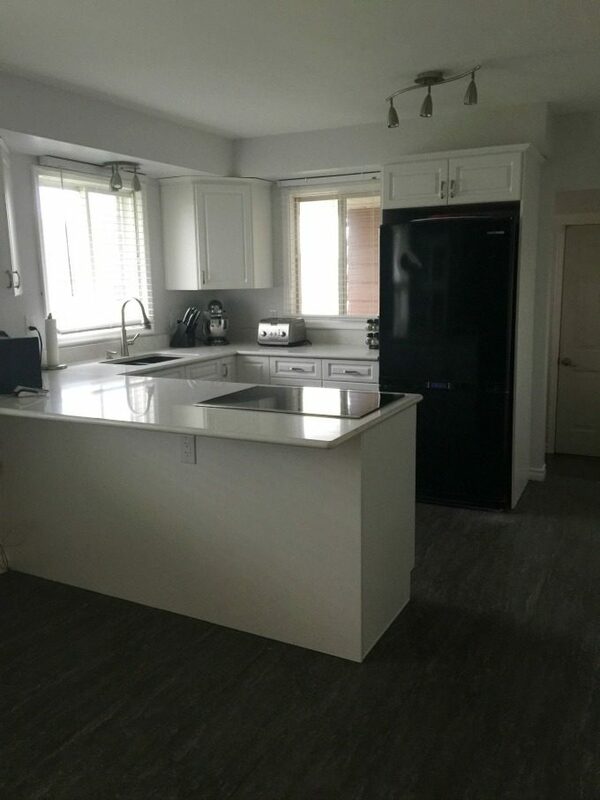 I’ve never done a kitchen reno , just a few upgrades through the years but would love to have it totally redone. Yours looks beautiful! 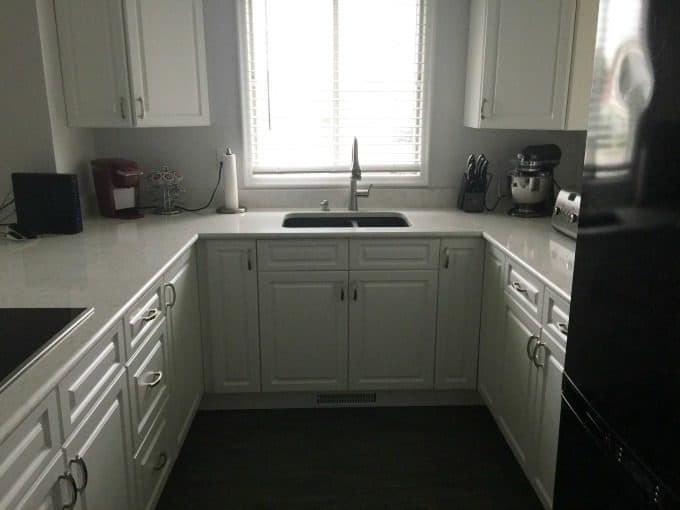 Your kitchen reno looks great! I just renovated my kitchen. It took about 5 weeks but well worth it. I have one question. Why is your dishwasher on the other side of the room and not next to your sink? Isn’t it annoying to carry the dirty dishes across the room? Just wondering. I don’t mind it. I’m so used to it now. It’s because of the way the plumbing was set up that there was no room next to the sink.